In recent blog posts, I've been outlining the difference between science and scientism. As I noted at the start, scientism is like the evil twin of science in some B-grade Hollywood movie, it looks like science, but it ultimately leads to a different outcome. Up to this point in watching our movie, the signs of the evil twin replacing the good scientist have been subtle. Many who aren't personally close to the goodly scientist don't notice a thing. But friends and family are beginning to have their doubts. Now the plot turns and suddenly the evil scientism does something completely contradictory to the good Doctor—he demands that his way must be obeyed. Only his ideas count. He has the brilliance and training and therefore no one should question his pronouncements! In our society today, we see certain leaders in the scientific community doing the exact same thing . We see it whenever someone mentions the theory of intelligent design. Because scientism views faith as an enemy, those who follow scientism will seek to shut down any evidence that points towards the existence of God. The intelligent design debate is a primary example. Our understanding of the origin of the universe and the origin of the diversity of life on this planet are big questions. They have become flashpoints of argument and debate, precisely because they put the question of God's existence on the table. But if the question of God's existence is allowed as a viable option, it would mean that there are things that science cannot tell us. Worse, for those who see science as the only way to gain knowledge, it would prove that there are other sources of knowledge out there, sources that fall outside the domain of science itself. To the person clinging to scientism, this is completely unacceptable. Therefore, such possibilities are dismissed as not even worthy of considering. Note that this dismissal is not because of the strength or weakness of the scientific content. It is simply because the answer to the question would show that science does not have the ultimate authority in all questions of life. But, here's where the evil twin of scientism has given himself away: in order to reject views that are counter to his understanding of the origin of life and the universe, he must also give up a key tenet of science. He must reject the concept of falsification. The scientific method is grounded in the concept of falsification. Experiments are attempts to see if the scientist's hypothesis will break under certain circumstances. Basically, the scientist is trying to falsify his hypothesis, his description of how natural laws will behave given a set of conditions. This is exactly what Galileo did when he wanted to test the idea that gravity pulls on everything with the same acceleration. By dropping two cannonballs of different weight from the Leaning Tower of Pisa and demonstrating that they landed simultaneously, Galileo showed that his theory was correct. If the heavier ball were to have hit the ground first, Galileo's theory would have been falsified and therefore abandoned for some other explanation. Because of this power to confirm or disprove theories about the way the natural world works, falsification is taken very seriously by the science community. In fact, some scientists hold that without the ability to falsify a theory, you are simply not doing science. 2 Indeed, this charge is very often leveled against those who resist the idea of Neo-Darwinian evolution3, but instead hold that life displays in its existence and construction an underlying intelligence. Wishing to dismiss any idea that a source other than a natural one could produce life, our villain will simply dismiss any claims or evidence for intelligent design with a wave of his hand. "It's not falsifiable" he charges and quickly dismisses any evidence the theory provides.4 But again, he's made a crucial mistake! In using such criteria, our evil twin has undercut his own view that evolution is science. Intelligent design and Neo-Darwinian evolution are two sides of the same coin, the coin of origins. To choose one side means the other doesn't show itself. But both sides must exist for the coin to exist! 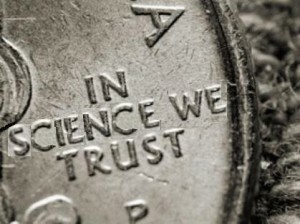 Those who hold to scientism would tell you that you must choose your scientific theory on the development of life from a coin that has only one side—there is no other side that's a legitimate choice. If the concept of falsification excludes intelligent design from being considered science, then by extension, it must also exclude it opposite, the theory of evolution. This criterion applies to both equally, which means they are either both considered such or neither are. Scientism would have you believe in one-sided coins, but thoughtful people should never fall for such ridiculousness. 1. A version of this portion of the article originally was post to the blog last. year. You can access it here. 2. Karl Popper was the leading proponent of using falsification to distinguishing which theories are scientific and which are not. He believed the concept that Hume had stated where one cannot universally prove a claim, but he saw that one can easily disprove a claim if it fails only one time. Therefore, to falsify a claim is the heart of science. See http://plato.stanford.edu/entries/popper/#SciKnoHisPre for more. 3. Neo-Darwinian evolution may be defined as a belief that all life has arisen from a single source through unguided mutations coupled with natural selection. See Chapter 10 for more details on this. 4. Tammy Kitzmiller v. Dover Area School District. No. 04cv2688 United States District Court for the Middle District of Pennsylvania. December 2005. p22. RE: "Because scientism views faith as an enemy, those who follow scientism will seek to shut down any evidence that points towards the existence of God." That's nonsense. Shutting out evidence is an attitude, not a belief. Anyone can do it: Catholic, Muslim, scientist, etc. You can say I'm into scientism, but I'm also certainly into investigating all hypotheses to see which makes the best sense. It is just to me, that the God hypothesis fails badly. In what way(s) does the God hypothesis fail badly? Why do you think the Good hypothesis fails badly?